The Green Hornet (Seth Rogen) and Kato (Jay Chou) are on the run from Chudnofsky's gang. Unlike my experience with Tron: Legacy, I have no prior connection to anything dealing with the Green Hornet. I've never listened to any of the radio programs from the '30s. I've never seen any of the film serials from the '40s. I've never seen the television series from the '60s that introduced Bruce Lee to American audiences. I haven't read any Green Hornet comics that were published on and off last century. I haven't read the endless stream of comic books that Dynamite Entertainment has been publishing over the past year or so, either. I have seen a few Seth Rogen films, though. Most times he's pretty funny and he usually plays the same guy in different roles. His take on Britt Reid, the man that becomes the Green Hornet, is no different. It's Seth Rogen, but this time he's wearing a mask. The Green Hornet is no masterpiece, but it is fun. Rogen makes this over the top ride more fun with his signature stating the obvious delivery ("Dude! You just kicked that guy in the face!" and so on). Director Michel Gondry has always approached his own projects with a certain element of whimsy (Eternal Sunshine of the Spotless Mind, The Science of Sleep), and he's a good fit for the playful tone of this feature. If The Green Hornet had been dialed down any, though, it certainly would have felt like a limp waste of time. Let's face it; the plot is pretty thin, but it's the mess that explodes around what little story there is that kept me engage. 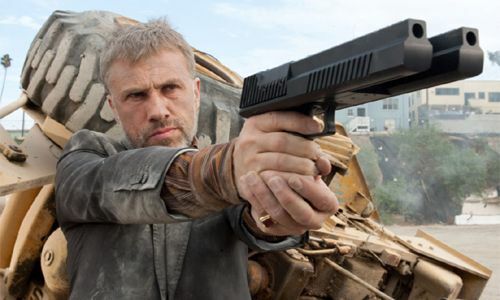 Chudnofsky (Christoph Waltz) and his glorious double-barrelled pistol. Christoph Waltz plays the villain of the piece, Chudnofsky, a crimelord that desperately wants to be feared. The thing is, while he is a very dangerous man, his image obsession and second guessing continually threaten to portray him as the opposite. Chudnofsky even built a ridiculous looking double-barrelled pistol because he thought it looked scary. It's a humorous character and Waltz has fun with it by walking a strange line between being goofy, but simultaneously playing Chudnofsky strangely straight. The break-out actor is Jay Chou as Kato. While he may still have some trouble delivering some lines effectively in English, he's a wonder during the action sequences. Still, he capable enough to play straight man to Rogen's goof-ball antics. Plus, he's good looking fellow. He'll be getting a lot of work soon. One thing that I really appreciated is that Rogen knows that he is the last person people think of as an action hero. To that point, his Green Hornet relies heavily on Kato to do most of the planning and almost all of the fighting. Sure, he gets a few punches in, but it's clear that he's an amateur when it comes to superheroics. 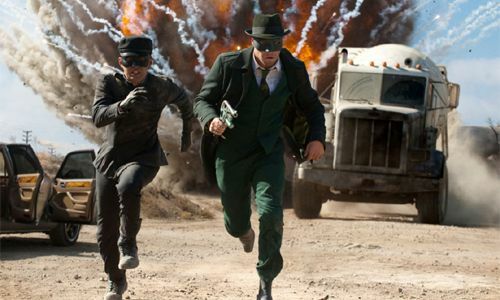 Kato (Chou) and the Green Hornet (Rogen) run from some exploding trucks. ﻿﻿I don't think the 3-D transfer adding anything to The Green Hornet. The only time that it really seemed effective was during some wonderfully rendered closing credits. This film would have been just fine in plain ol' 2-D. At least it didn't seem to darken the screen down too much as with most 3-D films. There's a lot of suspension of disbelief that is needed for viewing The Green Hornet. Still, it's not a film that aspires to be taken anymore serious than Rogen's other films. I was entertained and didn't find myself wishing it would end any sooner than it did.